Thank GOD we don’t have to deal with the Borg right now, but to a lot of folks, President Donald J. Trump is just as scary. He is not the figment of some science fiction writer’s wild imagination, but given his erratic, egotistical behavior, you couldn’t blame folks for thinking his mind is from another world. There is no question that ultimate power is the mother’s milk of existence for Pres. Trump, with having it his top priority, no matter who it hurts. After last week’s debacle in the federal courts surrounding Trump’s Muslim ban executive order, the debacle in the US Senate as ‘Bama Senator Jeff Sessions was confirmed as our new US Attorney General, and specifically the shutdown of Democrat Sen. Elizabeth Warren by Republican leader Sen. Mitch McConnell as she appropriately read a 1986 letter to the Senate opposing Jeff Sessions then for a federal judgeship, there is no question that our world has been invaded by the kind of political tyranny we’ve always fought hard to hold at bay, but couldn’t during the last presidential election. As recently as this past weekend, thousands of people converged on Raleigh for the 11th Annual Historic Thousands on Jones Street People’s Assembly and March,” this year making it clear that they have no appetite for Trump’s nonsense, nor much for foolishness from the Republican-led NC General Assembly. You know, the right-wing crowd that gave us the ignorant HB 2 “bathroom law,” and refuses to rescind it because they can’t openly accept just how stupid they already look. People know repression when they see it, and feel it. They know that the political forces that be believe in an America that has learned important lessons from the civil rights movement or the women’s movement, but rather pockets of America who refuse to learn or accept anything about a nation that fights to be forward in its thinking, and make opportunity available for everyone, just as Pres. Obama so envisioned. The folks who support Donald Trump want their deaf-dumb-and-blind-before-the-civil-rights-movement-America back, and they’re working hard to bring it back too. The question is, do we let them? One can only hope, as people fill the streets with cries for justice and energy for activism, that they can maintain this energy going into the next election, and the next, or else it’s all just a big waste of time. In which case, then, resistance would be futile. Let’s not let that happen! 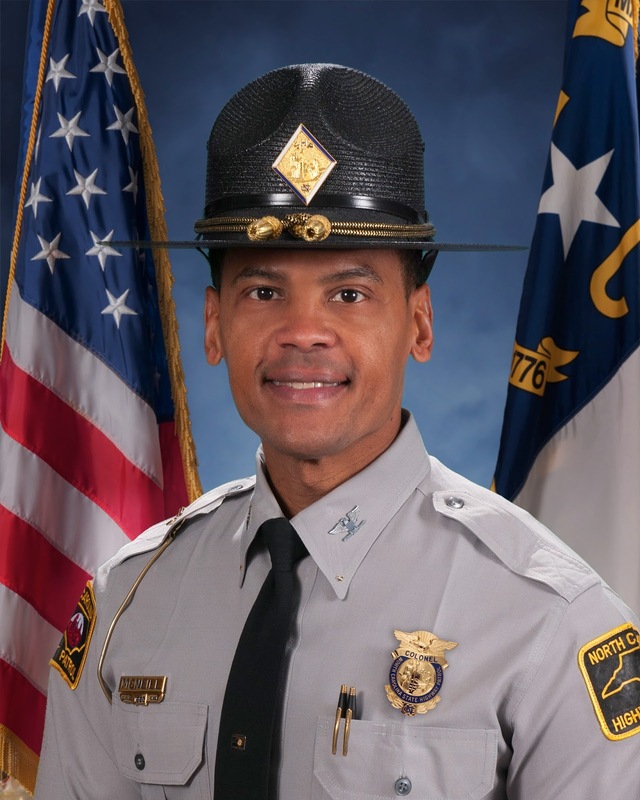 If you personally knew the NC Highway Patrol’s first African-American commander, the late Col. Richard Holden Sr., then you know Col. Glenn McNeill today, that agency’s newest leader. Humble but strong, principled and devoted to service, it is no accident that McNeill asked Holden, one of the first blacks to become a state trooper, to be his mentor many years ago, and learned those basic tenets of manhood, and law enforcement, from him. As of last Friday when he was sworn-in as the new commander of the 1600 troopers of the state Highway Patrol (SHP), Col. Glenn McNeill now has that chance. In an exclusive interview. Col. McNeill pledged to lead a patrol that looks like the citizenry it’s sworn to protect and serve. “One of the things that will be a priority in my administration is our retention, and our recruitment of more females and minorities, with the ultimate goal of the Highway Patrol working towards representing and looking like the population in our state,” McNeill said. What has made building bridges of understanding harder to accomplish in recent years, McNeil continued, is that unlike twenty-three years ago when he first joined the SHP stationed in Durham County, there is a greater strain on law enforcement resources now more than ever before, resulting in a greater demand on resources. One of those resources is time, and having enough of it for community outreach. “Well our members are so busy now, that [community outreach] hasn’t been a priority because we’re so busy running call to call,” McNeill noted. That must now change so that officers take the time to build relationships, and ultimately personal and professional capital, in the areas of the state that they patrol. As other law enforcement agencies have shown, doing so helps to create healthy partnerships between police and citizens in communities that need them the most. It also helps when there are “high-risk” incidents, like the fatal shooting of a gun-wielding motorist last Friday in Durham County by a state trooper after a high speed chase. The State Bureau of Investigation is probing that incident now. “If we made investments in those communities before those high risk incidents occurred, then we are able to earn some trust and some credibility with those communities [where they happen],” Col. McNeill says. Born in Whiteville, Glenn McNeill graduated from Mount Olive College with a degree in Business Management and Organizational Development, and UNC – Wilmington with a degree in criminal justice. He joined the SHP in 1994 as a trooper in Durham County, later serving in the Special Operations Section, and as a Troop Commander. Col. McNeill most recently served as Director of Training for the SHP since 2014. He graduated from the FBI National Academy in 2015 as a distinguished graduate. Having a mentor like Col. Richard Holden - who joined the SHP in 1969, taking command in 1999, and then retiring in 2004 after 35 years of service, passing at the age of 67 in 2014 - has certainly molded Col McNeill, so much so that when he interviewed with Gov. Roy Cooper for the job, he was honored just to be considered. The new SHP commander says he and his force are committed to the safety of the traveling public, and working with other law enforcement agencies to share information to reduce the flow of illegal drugs coming into the state, assisting in fighting domestic and foreign terrorism, and expanding on motor carrier enforcement to maintain the 78,000 miles of highway they cover. [WASH., DC] A federal lawsuit has been filed against the Jones County Board of Commissioners this week, alleging that for the past twenty years , black voters, who make up at least one-third of the county, nave been systematically denied electing black candidates of their choice to the five-member commission board. The last time an African-American was elected to serve was 1994. Attorneys with the Washington, D.C.-based Lawyers Committee for Civil Rights Under Law, along with two private law firms, say the at-large system of electing candidates in Jones County locks blacks out. The attorneys say this is the first major federal voting rights case of 2017. [RALEIGH] Though there’s no official estimate, organizers of last weekend’s 11th Annual H K on J March and Rally say they had the largest turnout in the event’s history. Some, however, estimate that at least 80,000 filled the stteets of downtown Raleigh, coming from all over the state, an even other parts of the country. Led by NCNAACP Pres. Rev. Dr. William Barber, demonstrators protested not only against the Trump Administration in Washington, but also the “extremist” Republican majority in the NC General Assembly, and laws like HB 2, and their attempts at voter suppression. [RALEIGH] Saying that he’s willing to compromise in order to get the HB2 “bathroom law” off the books as soon as possible, Gov. Roy Cooper Tuesday, flanked by Democratic leaders from the state House and Senate, proposed a compromise measure. Instead of a clean, straightforward repeal that Republican leaders say their caucuses reject, the compromise measure would increase penalties for crimes committed in public bathrooms and locker rooms, and require municipalities that seek to enact their own local nondiscrimination ordinances to inform the state legislature 30 days before they do. Republicans apparently weren’t impressed. The HB2 law the GOP majority passed required transgender citizens to use the bathroom of their original gender. Republicans say Cooper’s compromise still allows men to use women’s bathrooms, regardless of any new penalties. [RALEIGH] A three-judge panel has now sided with the state Senate, and ruled that because Gov. Roy Cooper’s power to appoint hasn’t suffered any, Senate confirmation hearings of his Cabinet appointments may proceed. Last week, a three-judge panel granted the governor an emergency stay of the hearings, based on his argument that it was a violation of his constitutional right to appoint his team. Republican Senate leaders countered that they had the constitutional responsibility of “advise and consent, giving them the right to vet Cooper’s appointments before they take office. A spokesman for the governor says he will wait until March 7th for a full hearing on the constitutionality of the hearings.